Following the discussion on the role of Internet in the formation of ties across space, this paper seeks to supplement recent findings on prevalence of location-dependent preferential attachment online. We look at networks of online communities specifically aimed at development of location-independent ties. 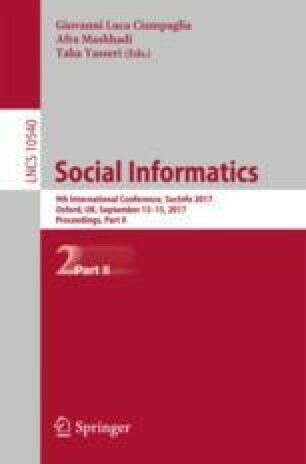 The paper focuses on the 25 largest communities of software developers in the leading Russian social networking site VKontakte, one of the communities being studied in depth. Evidence suggests that membership and friendship ties are overwhelmingly cross-city and even cross-country, while an in-depth analysis gives ground to assume that, commenting and liking in such communities might also be location-independent. This group case study provides some insights into a nature of professional networking and shows independence of the three networks: the friendship network as a means of group identification, the commenting network as an advice-giving tool, and the liking network as a result of approval by occasional visitors. This research was supported by the Basic Research Program of the National Research University Higher School of Economics, 2014.